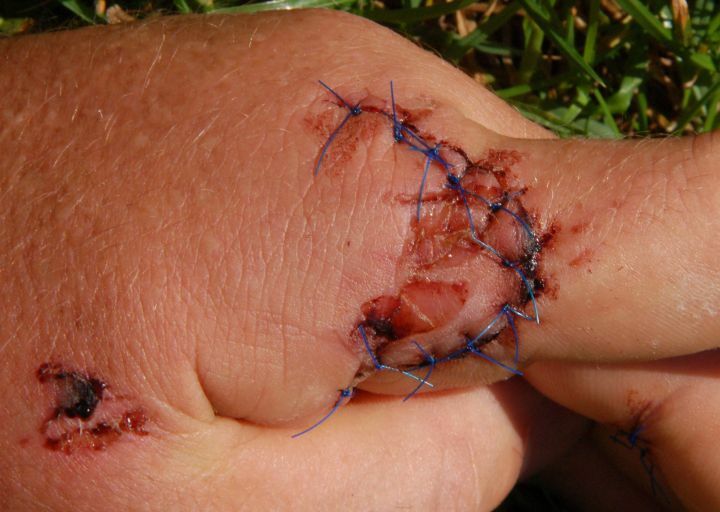 Following a slight mishap on the way to work on Wednesday 22nd August, a head on collision with another cyclist on byway L17, I ended up having 15 stitches in my hand. Following a phone call to get Ann out of bed, she took me to the walk in centre at Loughborough. We arrived at 8:30am and left at 9:30am following a half hour sowing session. 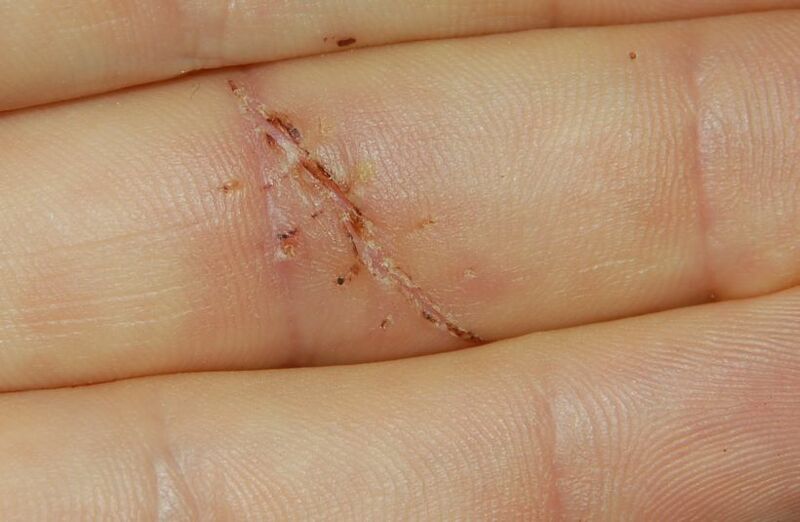 I had 11 stitches in the wound above, which fortunately it was clean and there was no nerve or tendon damage. I think I caught it my brake lever, and rolled the top layer of skin etc back. In addition to the big cut I had a bit of a slash on my middle finger which needed 4 stitches. The stitches used were the modern "plastic" ones not cat gut. They may be cheap and easy to make and sterilize, but they are a bit of a pain. Instead of lying flat with a soft feel, they stick out and have a hard prickly feeling. The stitches on the morning I was due to have the stitches out. 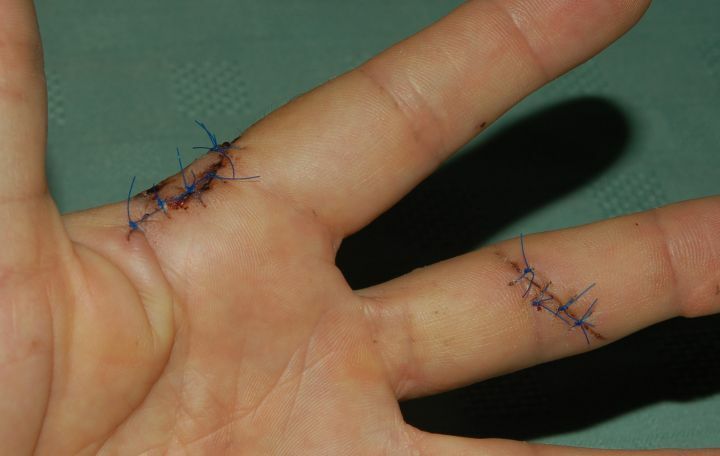 I went to see the nurse at the local doctors after work and she removed every other stitch. She was concerned that due to the position of the wounds the cuts might open up. She was correct - this is 3 days after half the stitches were removed. 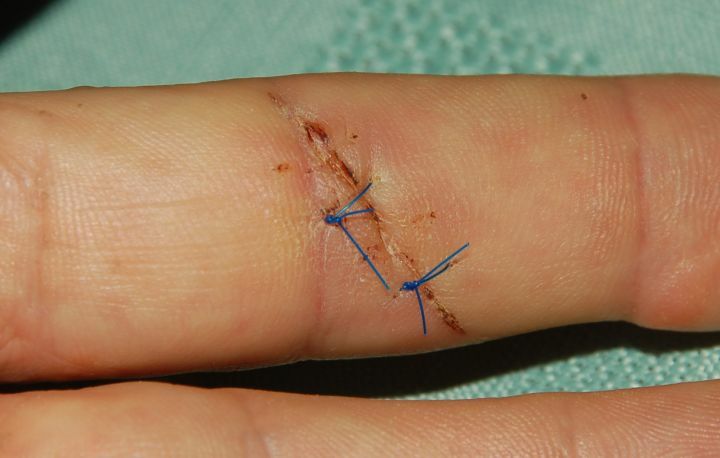 I went to see the nurse at the local doctors after work and she removed every other stitch. She was concerned that due to the position of the wounds the cuts might open up. She was correct - this is 3 days after half the stitches were removed. As you can see the wound is gradually healing up nicely. I went to see the nurse at the local doctors after work and she removed every other stitch. She was concerned that due to the position of the wounds the cuts might open up. She was correct - this is 3 days after half the stitches were removed. It is this part I am more concerned with. 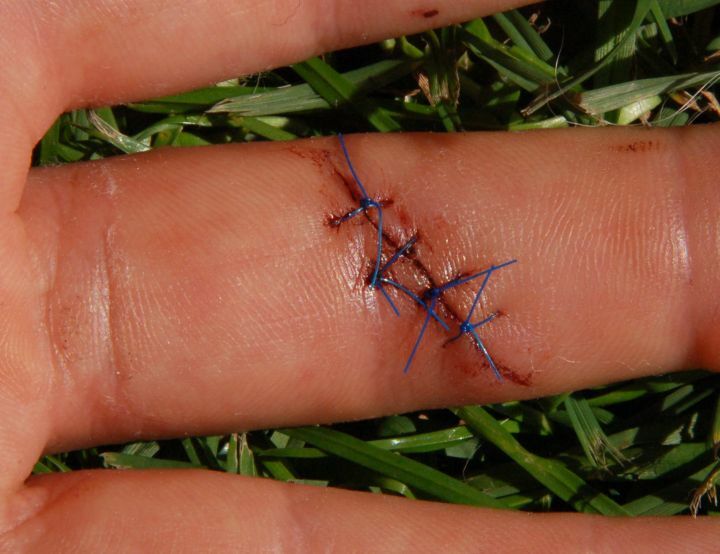 5 Stitches were removed leaving 6 in this wound. When I got home after having half the stitches out, I noticed the some parts had opened up, so it was a quick trip to the local chemist to get the wonderful 3M product - Steristrips. A must for every first aid box. They are a lot better then plasters for many cuts. I cut them in half to hold shut 3 parts of the wound that opened after some of the stitches were removed. Ceri whinged a bit when I got her to assist me putting on the Steristrips. 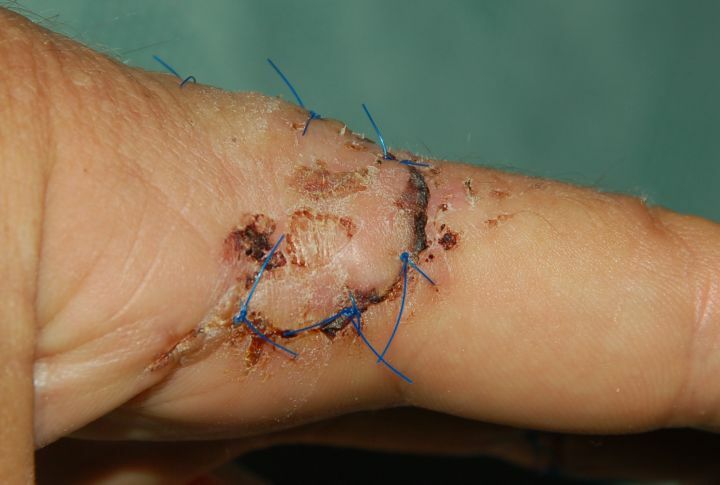 The remaining stitches came out on Monday 3rd September, 12 days after the prang. 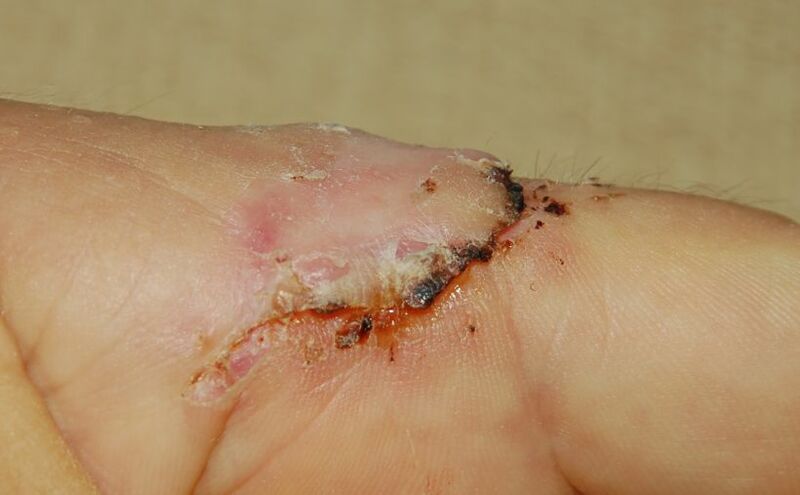 The wound looked very messy still along the "thumb" edge. 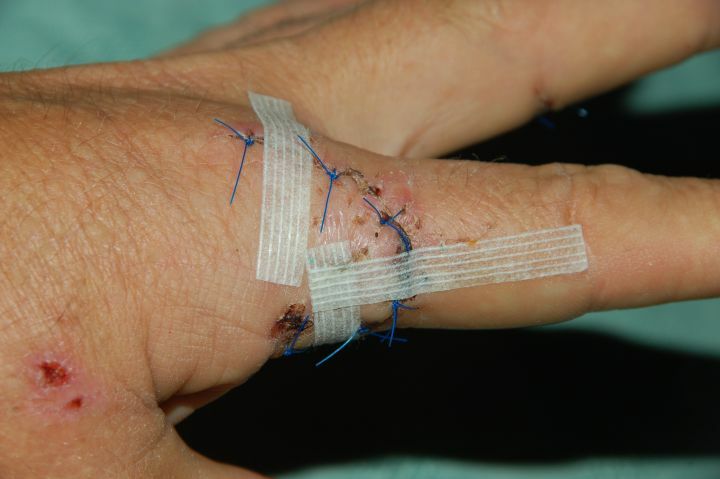 The remaining stitches came out on Monday 3rd September, 12 days after the prang. The wound looked very messy still along the "thumb" edge, but the other side was not too bad.. 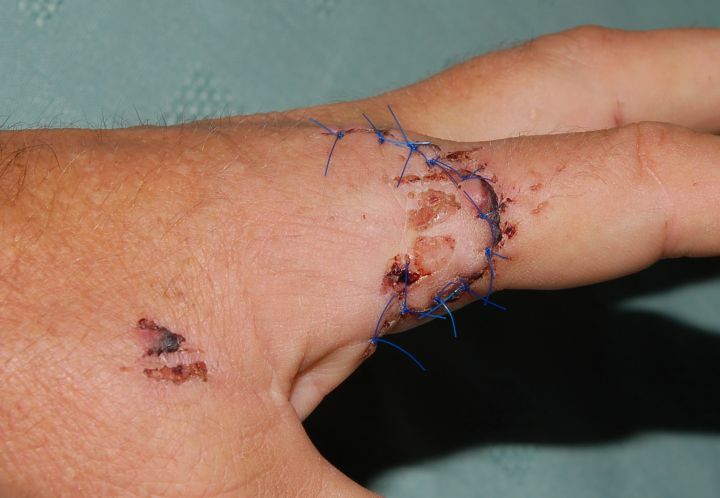 The remaining stitches came out on Monday 3rd September, 12 days after the prang. 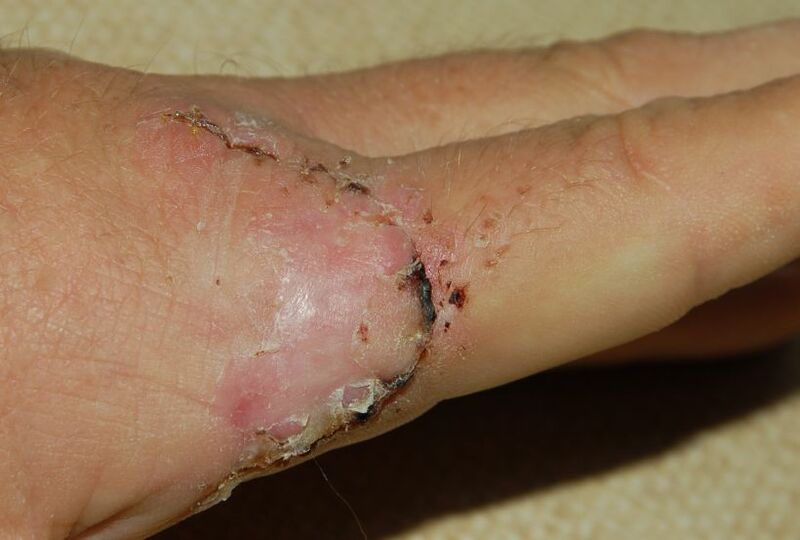 The wound on my middle finger had healed fairly nicely..
As a birthday treat, I did what Ceri and Ann told me not to do - I picked of the dead skin etc around the wound. It caused the wound to bleed a bit, but not much. 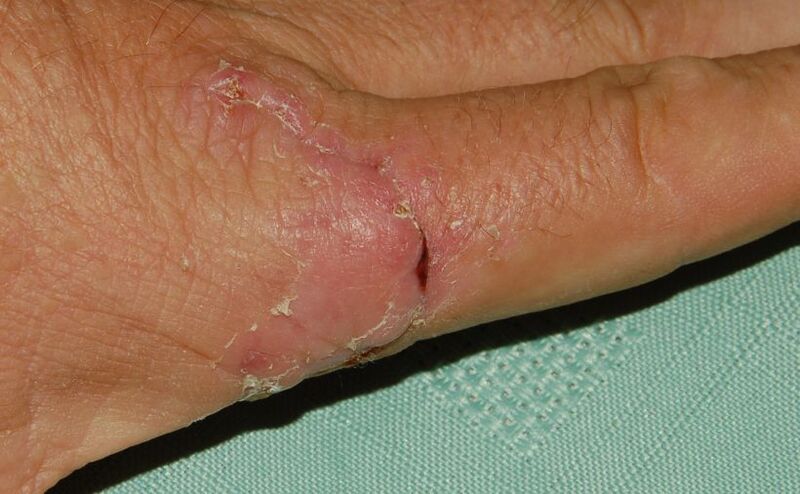 The following day, day 14, the wound started to look very healthy. The following day the wound started to look very healthy, only a small section along the "thumb" edge was still a bit weepy. Dead skin was beginning to flake of the middle finger and I should have a nice scar to add to my collection. I rode my bike to work for the first time since the prang today, however I will keep out of the GMP areas at work for at least another week. No problems apart a slight soreness at the base of the cut area on the thumb edge. Finger movement and nerve sensation is OK. I am still using a single steristrip to protect the weepy area, ie to hold it closed.